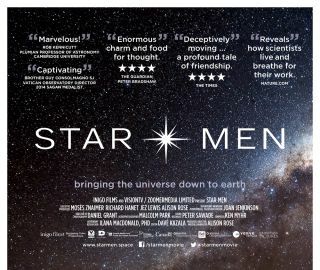 The poster for the documentary "Star Men." The documentary "Star Men," which has just begun to play in select theatres in the United States, uses the life stories of four prominent astronomers to take a compassionate look at aging, death and humanity's search for meaning. Following a screening of "Star Men" at the California Institute of Technology (Caltech) in Pasadena last month, one of the film's subjects, astronomer Neville (Nick) Woolf, said that when the project began he thought it would be a science documentary set against the backdrop of the American Southwest. There is certainly science in the "Star Men." All four of the film's subjects made major contributions to the astronomy and astrophysics, and the movie briefly outlines their work. But the story is primarily about a 50-year-reunion road trip that reunites the four friends and takes them to some of the places they visited while they were all working at Caltech, including a handful of major astronomical observatories. Many science documentaries work hard to "humanize" the scientists they feature, and "Star Men" certainly provides the audience with a look at the personalities of its subjects. Audiences see them crack jokes together and rekindle the spark of friendship that first ignited a half century before (I probably could have watched 2 hours of just these guys talking to each other); viewers see them get frustrated with each other, as even good friends are bound to do during a days-long road trip. And filmgoers see the scientists deal with the limitations of old age (they are all in their mid to late 60s), such as when two of the men decide to embark on a 14-mile (23 kilometers) hike they took in the early 1960s, and struggle to make it to the end. The film's director, Alison Rose, said during the Q&A at Caltech that her objective with the film was "to value scientists." Rather than trying to demonstrate that these scientists are just like everybody else, Rose highlights how each of these men are unique and extraordinary. They're people, sure, but they're people who have chosen to dedicate their lives to the pursuit of grand questions about the universe; they've solved riddles about black holes at the centers of galaxies, the large-scale structure of matter in the universe and the origins of material on Earth, among other topics. When Rose asks Woolf what he has learned from a lifetime of studying the cosmos, he seems to be at a loss for words (even though he's an excellent speaker throughout the rest of the film). He can only manage to let out a half-whispered, "Wow." That might be his answer to the question, or he might be expressing awe at the question itself. STAR MEN MOVIE TRAILER from Inigo Films on Vimeo. Full poster for the documentary "Star Men." In her introduction, Rose gives each of the four astronomers a descriptive title: Griffin, the instrument maker; Lynden-Bell, the theorist; Woolf, the visionary; and Sargent, the observer. While "visionary" isn't an actual job title, the other labels given by Rose accurately describe the kind of work the four men do. Because of those descriptions, coupled with the very different personalities of each man, the film ends up being a fantastic illustration that science is filled with all kinds of people. Griffin, the "instrument maker," expresses his emotions more subtly than the other three men, his body language barely changing when he's expressing frustration or joy. When he went to Caltech and did observational work at the nearby Palomar Observatory, he dedicated himself to studying the light from stars. A technique called spectroscopy lets scientists essentially fan out the light from a star and see all the different wavelengths. Griffin produced a detailed profile of the light from one star in a book containing hundreds of pages of graphs. Lynden-Bell, a mathematician with white tufts of hair just above his ears and an almost childlike positivity about him, has a long list of accomplishments in theoretical astrophysics. Early on, he showed that very bright sources of radio light, called quasars, are young galaxies. The bright radio emissions come from a supermassive black hole at the galactic center, surrounded by large amounts of material that gets accelerated by the black hole's gravitational pull. He was also part of a group of scientists known as the Seven Samurai who proposed the existence of the Great Attractor. He is a recipient of the prestigious Kavli Prize, given to scientists for seminal advances in astrophysics, neuroscience and nanoscience (areas not specifically covered by the Nobel Prize). Woolf speaks like a philosopher as much as a scientist, and his interviews with Rose make a great contribution to the film. His career has straddled observation and instrument design. In the 1960s, he helped create a balloon-borne telescope that measured infrared light from the center of the galaxy; in the 1980s he helped design and develop the Large Binocular Telescope. He served as director of the Multiple Mirror Telescope and principle Investigator for the Arizona arm of NASA's Astrobiology Institute. He helped search the universe for silicates (a type of material that makes up a large amount of Earth's crust) and was part of the team that first identified the substance in comets, then in the material ejected by red giant stars and in the medium between stars. Sargent's father was a gardener for a wealthy estate, and the family lived in a house that was provided to them, which didn't have electricity or running water. He was the first member of his family to graduate high school. Sargent was part of a team that provided the first evidence of extremely massive black holes at the centers of galaxies, based on observations of the stars in those galaxies. Scientists now believe that there is a black hole at the center of almost every galaxy in the universe. His work on galaxies and quasars, combined with observations of helium in the space between galaxies, contributed to a better understanding of the universe's birth in the Big Bang, and the large-scale structure of galaxies in the universe. Near the end of the film, viewers learn that Sargent is seriously ill. During the movie, he knows that his time is limited when he begins a new observing run on a telescope at Caltech, where he still works at the time of filming. The film ends by letting the audience know that he passed away less than a year after the reunion took place. In the film, all four members of the group discuss their feelings about death and the possibility of an afterlife. For some of them, those feelings are mixed up with religious beliefs. Lynden-Bell and Woolf both talk about the importance of death in science, because it lets the younger generation come in and introduce new ideas. The film does well presenting a discussion of age and death that is not bleak but also not overtly rosy; these men are dealing with the toll that age takes on the body and the mind, and it's devastating to watch the friends say farewell to Sargent when they know how ill he is (even though they don't openly acknowledge this as they go their separate ways). At one point in the movie, Sargent says, "The question is always the same one — 'What the hell's out there?'" He's referring to the field of astronomy, but of course he could just be talking about the question that's always driven humans forward. And that quote may reveal that the question at the heart of Rose's film is this: By studying the physical world beyond Earth, did these scientists gain any additional insight into the metaphysical one? That's left to interpretation, but some viewers may feel, after seeing the movie, that the pursuit of knowledge offers some solace for the human condition.